1) Beach Boys lunchbox. Daddy got it brand new at the Pearl Harbor PX. “Little Surfer Girl”? You bet. 2) Sleeveless blouse and short set, made by my mom, of course. Sky blue Hawaiian print with creamy white plumeria blossoms scattered on the fabric . . .very cute. Freshly hemmed, freshly ironed. 3) New pair of zoris. Zoris (rhymes with “stories) were my school shoes, play shoes, running down the block to the beach shoes, go everywhere (except to church) shoes. (I knew that “mainland” girls wore brown mary janes with white socks as they skipped their way to the little red schoolhouse in my reading books.) But I was an “island” girl. And these were my “back-to-school” zoris. The velvet thong that swished between my toes was softly padded and black as lava rock. 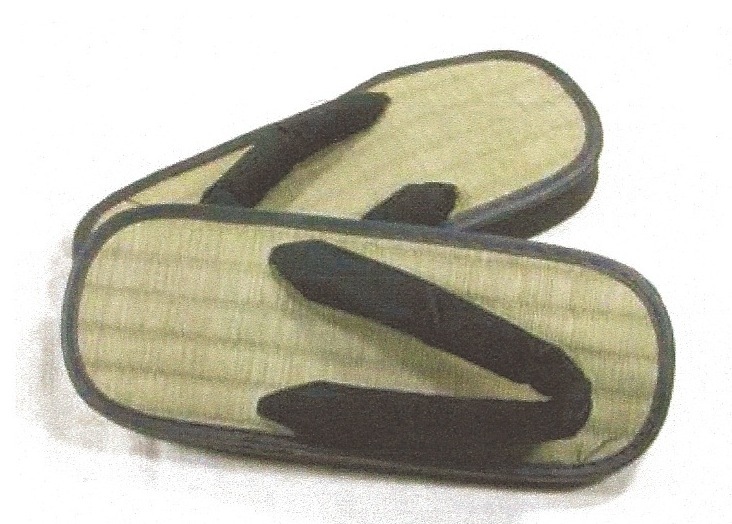 The tatami mat insoles were clean and stiffly smooth and smelled like fresh straw. As long as these things lay on my bed the night before? Anything was possible in the fourth grade. Tomorrow morning would be the first day of my best year ever! Now, so many years later, in Tennessee I have a different ritual. 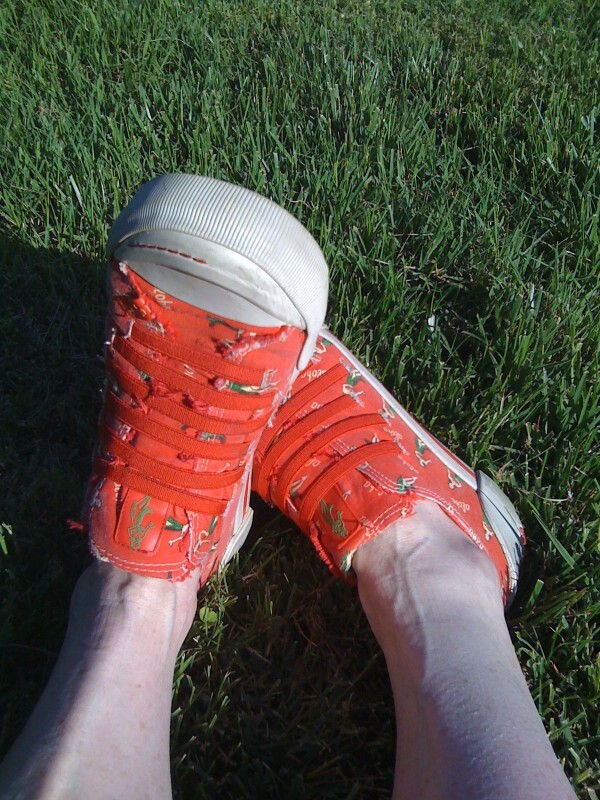 I don’t really feel ready to write unless I’m wearing my Red Hula Girl Tennis Shoes by Rocket Dog. Maybe it’s the tiny hula girls smiling up at me. Maybe it’s the yellow letters spelling out ALOHA . . . but I’m more confident and more excited and more at home when my feet are snug inside My Blogging Shoes. I’ve confessed my writing quirk. I wonder . . . is there a faded bathrobe you must pull on before you can open your laptop? Or does the coffee mug your son made at art camp absolutely have to rest at the upper right hand corner of your desk before you even think about writing? Are the Beach Boys blaring in the background as you boogie to work? Double-check your list. After all, tomorrow actually could be the first day of your best year ever! Great title! Is it for rent? Maybe lyou should copyright that as ‘Intellectual Property’? Or maybe a domain name for a web site?!! Who couldn’t appreciate the reminisce back to fourth grade and those things we felt we needed in order to function? Sadly my list of quirks isn’t nearly as well developed or interesting as yours! My my my my my blogging shoes – woo hoo hoo, woo hoo hoo . . . sounds like a song we could “boogie” to? Thanks for your comment. Great timing . . . I needed the encouragement after my 6 week absence . . . new posts coming soon! PS Am enjoying your family reunion funny/horror stories . . . we’ve all been THERE! Good writing! I make a nice cup of tea and site down at the pc to type and drink. Thanks for the comment and reading my post . . . fellow bloggers are ALWAYS welcome! I keep a running list of blog ideas on me, since otherwise I’ll usually have a blank when I’m actually ready to write and draw. I don’t have a ritual per say, but I usually like to have something to drink since writing a post takes an hour or two for me, since I usually make accompanying drawings. I haven’t laughed that much since, oh . . . well, last night Craig Ferguson was a re-run with Tina Fey but I still laughed. What an original voice you are!? And your drawings are hilariously weird, too. And even though I’m 2/3 through your birthday flowchart (yikes!) you have a new/old fan in me! Thanks for the comment which lead me to your site which lead me to your work which is why I think I love blogging. PPS I really DO wish my Kindle smelled like a book. Hi just discovered you blog. Enjoyed it very much. You seem to have quite a following in a short time. Anywho, wanted to say hello because I clicked on you based on Hawaii. My father was born and raised there (in fact he is visiting right now, his annual trip back “home”). Anyway, keep up the writing! Thanks!! Same to you! Would honestly love to get your dad’s perspective on the “older” Hawaii . . . I left in 65 and went back in 2001. To say things had changed is an uderstatement . . . and fodder for MANY posts to come I think:-) Thanks, too for subscribing . . . you know all too well how much THAT means to a newbie blogger! I so enjoy reading your blog. Keep up the good work. It is funny to think about what rituals one has when you do not realize it until you do just that….think. Regardless of where I am, before I start to work on the laptop, I must have a glass of some kind of liquid nearby….water, coke, tea…but nothing stronger or I would hate to see the plethora of nonsense that would occur. As for the Mary Jane’s, mine with black patent leather and only worn to church. To school it was the white and black lace up saddle loafers or the penny loafer (better known as the Weejun)….and you had to put the penny in the pocket on the top. Keep blogging as it is fun to relive the memories that you provoke! The penny in the weejun! Absolutely did that too during a brief preppie period in the early 80s:-) As for mary janes? I also had black patent and like you, they were ONLY worn to church. Wait . . .
Brainstorm! just got an idea for a follow up blog . . .Thanks! I’m loving your musings! As long as we’ve been in the same family, I feel like I’m getting to know you better! Keep it up, girl. Since I don’t write, or blog, I don’t have blogging shoes, but I do have a cat that has to be curled up in my lap while I scrapbook! Does that count??? I will have the song, “My my my my My Boogie Shoes” in my head the rest of the day. Except now it will say “mymymymymy Bloggin’ shoes” !!! HAHAHAAAAAA! Now I’ll have it in MY head, too! Thanks, Kay . . . for reading, for commenting and for subscribing. Your support as I get this blog off the ground means so very much! !